After a quarter century working alonside their father, brother and sister team Peter & Ariel Rubissow have taken the helm of the family business, and reinvented it from the ground up. Literally. Together with their new winemaker Timothy Milos, Ariel and Peter have spared no effort nor expense to improve the quality of winemaking from the family estate, which is hidden high on a forested ridge of southern Mt. Veeder facing toward Los Carneros. Indeed, the new wines' rich, expressive style is the direct result of meticulous viticultural management, extensive berry thinning and hand work, organic vine care, modern winemaking, and sourcing of superb artisanal French oak barrels. The new RUBISSOW wines - which debuted with 2004 vintage - are a daring departure from the family's previous winemaking style, while staying true to the essential terroir of the Rubissow estate. Reviews of the wines, which are 100% organically grown and sold primarily via restaurants and mailing list, have been excellent, including consistent 90+ point reviews for the Reserve Cabernet from Wine Enthusiast Magazine, "Years's Best Cabernets" for the 04 Reserve from Wine & Spirits Magazine, as well as top placements at the nation's hottest restaurants, including Per Se New York, Quince San Francisco, Joe's Venice Beach, Press Napa and many more. In 2009, Peter, Ariel and debuted their new LOLA KAY Napa Valley brand, a line of exceptional and affordable Napa Valley negociant wines. These are serious wines of extreme quality for the price. Out of the gate the wines have been a remarkable success and are growing in leaps and bounds as sommeliers, wine buyers and wine lovers discover LK. Currently two wines are made under the LOLA KAY label. LOLA KAY Sauvignon Blanc Napa Valley, and LOLA KAY Proprietary Red Wine Napa Valley. To meet fast growing demand, production has doubled with each new bottling. To join the wine club, visit www.rubissowwines.com or call 707-253-8605. REVELERS & RAVERS CLUB is the exclusive membership circle of Rubissow Wines' most enthusiastic exponents. REVELERS: 3 bottles shipped 4 times per year. RAVERS: 6 bottles shipped 4 times per year. 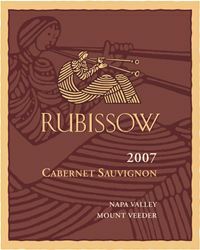 20% off all Rubissow wines. 20% off on all reorders. Each shipment features 3 btls (Revelers) or 6 btls (Ravers) of our estate grown, single vineyard wines. All are sustainably farmed. You will receive each new release of Rubissow Merlot, Trompettes, Cabernet Sauvignon, Reserve Cab, and Syrah.